Building an inter-oceanic canal crossing Nicaragua "is closer than ever" and will markedly reduce travel time and costs for mega-ships, a Nicaraguan senior official said here Tuesday. "The aim is to convert Nicaragua into an international maritime transport center for mega-ships that will be mainly responsible for maritime transport in the near future," Paul Oquist, executive director of the Nicaragua Grand Canal Commission, said during an event at the Council of the Americas in Washington. Once completed, he emphasized, the time needed for one of these ships to sail from New Jersey to Shanghai will be reduced to two weeks, given that mega-ships are too big to transit the Panama Canal and currently have to sail around the southern tip of South America. In his speech, Oquist emphasized Nicaragua's solid macroeconomic situation with annual economic growth averaging 5 percent since 2011. The $50 billion canal project is being handled by China's HKND Group, which received a 50-year concession to build and operate the waterway. Oquist said that there has been much disinformation regarding the project, especially concerning the environmental impact, adding that HKND had shown great interest in emphasizing "quality and cost reduction." He said the project will displace 28,000 people living in the zone and that they will not be relocated "more than 12 kilometers (7.5 miles) from their original communities." In addition, he said that HKND had made a commitment that half the labor force participating in the construction will be locals. The project is enormous, Oquist said, with the investment representing more than four times Nicaragua's annual GDP, and it is estimated that during the construction phase it will employ 50,000 people. This week, Nicaragua announced that Australia-based geological consultancy CSA Global will collaborate in defining the seismic risks to the canal as part of the feasibility studies. The Nicaraguan canal will be three times larger than the one operating in Panama, winding 278 kilometers (173 miles) from the Pacific coastal town of Brito to the mouth of the Punta Gorda River on Nicaragua's Atlantic shore. A significant portion of the canal route - 105 kilometers - runs through Lake Nicaragua. A ship prepares to pass through the Miraflores Locks. 1. 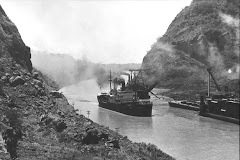 The Panama Canal couldn't be built the same way as the Suez Canal, and nobody thought of that -- well, at least nobody tried to stop France from attempting to build it that way for 10 years. Ferdinand de Lesseps, the French diplomat who led the development of the Suez Canal, worked on the Panama Canal from 1879 to 1889. He wanted to build a canal at sea level and avoid the use of locks, which allow ships to pass between different water levels. He had his workers dig into the land, just as they did with the Suez Canal. The trouble was, Panama's climate is different: it has a dry season and a rainy season, and every rainy season, all the land they'd dug out would flow right back into the canal. Très frustrant. It wasn't until 1905, after extensive engineering studies, that the US settled on building the locks. 2. Mosquitos very nearly prevented its existence. The other reason that de Lesseps failed was that malaria and yellow fever spread tragically and relentlessly through his workers via mosquito -- but they didn't know that. Thankfully, by 1904, 15 years after de Lesseps had left, the little bloodsucking culprits were found out, and countermeasures against the mosquito population made the Canal possible. 3. The Panama Canal is politically neutral. Since the Torrijos-Carter treaty in 1977, the Canal has been officially and permanently neutral, providing service to ships of all nations. This means that if any nation were to attempt to seize the Canal, every other nation in the world would have a problem with it. Pretty smart. Panama itself has no military, nor do they need one in order to protect the Canal. 5. Giant ships are built specifically to fit through the canal -- the technical term is "Panamax." The Panama Canal Authority openly publishes the maximum allowable dimensions for ships, which is evident when you see one pass through a lock -- they only spare what appears to be few feet on either side of the massive vessels. Ships that are too large for the Canal are referred to as "post-Panamax." 6. Trucks keep passing ships from hitting the sides of the locks. Even those Panamax ships move through the canal propelled by their own engines, so in order to keep them from grazing the sides of the locks, trucks are cabled to the front, back and sides of the ships. The trucks move forward and back on lock-side tracks to keep the cables taut and the ships in the middle of the locks. 7. The Panama Canal is expanding, and even deeper, even wider post-expansion plans are already being made. "Cause baby there ain't no river wide enough, to keep me from getting to you, babe." The $5.2 billion Panama Canal Expansion Program began in 2007 and will allow the passage of larger ships (ships which adhere to the "New Panamax" standards). The widened Panama Canal will still be smaller than some of the world's largest container ships, so the Canal will likely be expanded again within a few years of the expansion's completion. Bonus fact from my tour guide: the new lock system will have sliding, not swinging, gates. Workers in hard hats cross over one side of the Miraflores Locks. Bonus fact: those are the original gates, operational since the Canal's opening in 1914. 9. East is west and west is east in the Canal. Seriously. Due to the curvature of the isthmus, one must travel west to get to the Atlantic Ocean, and east to get to the Pacific side. That's messed right up. 10. The Panama Canal was Spain's idea. Though it was first attempted by the French, completed by the Americans and is now controlled by Panama, the canal was actually the brainchild of King Charles V of Spain in the early 1500's, and he even began a study of the feasibility of the project which would begin 350 or so years later. Today, a bust of Charles V stands in Panama City's Casco Viejo ("Old Town") in commemoration of his vision. Plaza Carlos V in Casco Viejo, Panama City. Investigations are under way after tests of the new locks for the Panama Canal detected some seepage. Filling of the new locks began in June, marking the start of a phase of operational testing of the locks, including culvert valves, maintenance bulkheads and gates. As part of this testing, some water seepage was detected at the new Pacific Locks in a section that separates the middle chamber and lower chamber. The seepage was found during stress-testing through exposure to level differentials much higher than those required for normal operations, but that may occur during dry-chamber maintenance works in the future. The Panama Canal Authority (ACP) is now awaiting a formal report from the contractor Grupo Unidos por el Canal (GUPC) following detailed inspections. The report will analyse the root cause, as well as the recommended repair methodology. ACP will then assess if the project's completion timeline will be affected. It has appointed two independent structural engineers to conduct an evaluation of the reasons for the issue and assess GUPC's solution.